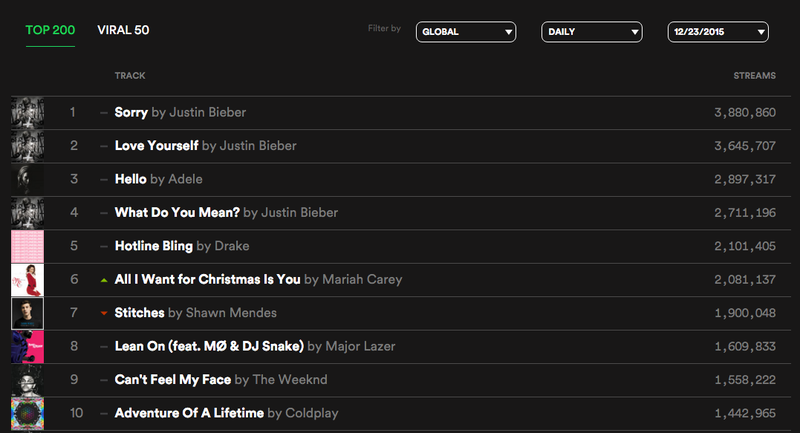 Mariah Carey’s ‘All I Want For Christmas Is You’ is the top-streamed Christmas song this year, according to Spotify’s latest streaming stats. The song has reached number six across the world this week, boosted by some 9.1 million individual plays totted up from the week to December 17. Christmas week’s stats should go live soon but yesterday alone saw the 20-year-old ballad played more than 2 million times. While the UK wins hands down for streaming the poptastic track, Mariah is now up at 20th in the US iTunes download chart, while she’s at 23rd in the UK.